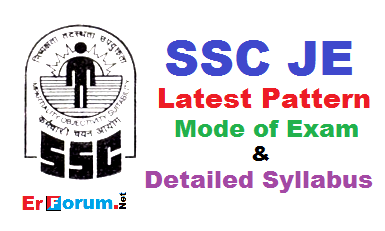 SSC [Staff Selection Commission] will hold an open competitive Computer Based Examination for recruitment of Junior Engineers, Group ‘B’ Non-Gazetted posts in the Pay Band of Rs.9300-34800/- plus Grade Pay Rs.4200/- (pre-revised). Aspirants are searching for Pattern, Detailed Syllabus and Mode of Exam. In this post you will get all info at one place. Only after qualifying the Objective Tests you are eligible to appear in Conventional Test. Note: There is no sectional Cutoff for different Sections of Objective tests. Only Overall Cutoff is there.